If you are looking into spray foam for your house or business structure, there are some things that you should know about the product and the process. What actually is spray foam? Spray foam is a polymer/polyurethane product. Major U.S. manufacturers such as Dow Chemical and DuPont are major suppliers of the foam material. How is the expanding foam applied? Our technicians apply the foam material via a spray gun. The foam is sprayed between joists, onto exterior walls, and onto the interior of foundations and as it is applied, expands into cracks and crevices as well as grows to many times its original thickness as it cures. What kind of energy savings can be realized? Due to the insulating and thermal barrier that spray foam affords, your heat and air conditioning systems will not need to work as hard, or as long, to reach and maintain a constant temperature. Its air barrier properties keep drafts from entering and conditioned air from escaping your building or home. How do open cell and closed cell materials differ? Open cell foam is called that because the bubbles that make up the product have breaks in them. Closed cell foam has bubbles which are unbroken or closed. Because of this structure, closed cell foam is a denser product with a higher R-value per inch and also provides and moisture barrier. Is spray foam better for new or existing structures? 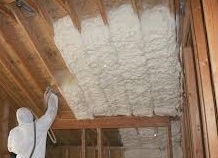 Spray foam is appropriate and recommended for new or existing homes or new or existing commercial buildings. What if I need to add electrical or duct work? Spray foam can be applied around existing systems and if new systems need to be installed, they can be installed inside the thermal envelope. For access, your electrician can always cut away spray foam that might be in the way of access to piping. What is involved in getting an estimate? Our estimator will travel to your building and measure the spaces that need to be insulated. He or she can also make recommendations as to the right type of foam for your spaces and give you an on-the-spot recommendation.